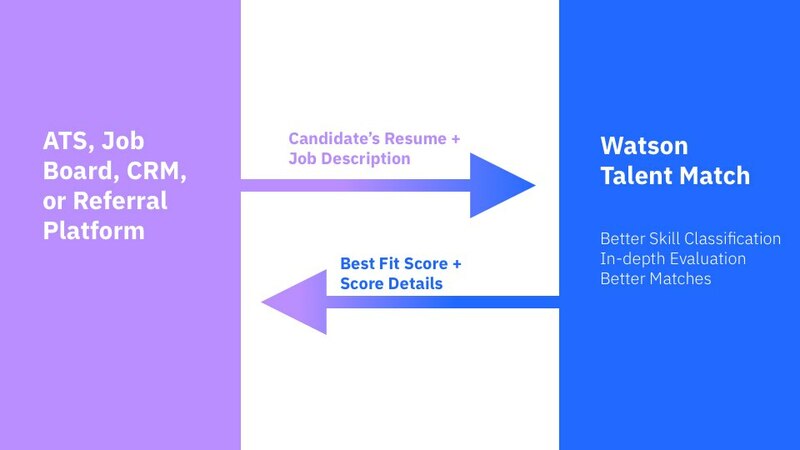 Let the power of Watson assign a best-fit score in seconds between a candidate and job description that takes into account their skills and competencies. With IBM Watson Talent Match, you can look beyond keywords to evaluate important intangibles - such as indirect skills - that are not explicitly specified on a resume. Take advantage of rigorous evaluation of unstructured information, job classification, competency, skills, behavioral traits, and more. IBM Watson Talent Match is your expert hiring advisor. Convert unstructured and semi-structured information into a standardized job profile or person talent profile. This includes job classification, competency classification, and skills classification. Perform thorough evaluation of required and preferred skills. Behavioral evaluation – for skills like communication and leadership – is performed through natural language classification. Enjoy a higher confidence of scores that match a job profile and an applicant’s talent across multiple dimensions. See the score and the matching profile elements detailing how the score is generated.